I've been a vegan baking fool ever since my sister gifted me with a copy of Joy of Vegan Baking for Christmas. Initially, my schedule kept me from dedicating time for baking, but I've caught up over the past week or so, finally having the chance to heat up my house by turning on that oven for baking! Anyway, today is my birthday. Many of you offered me kind wishes earlier in the month when I celebrated with my family, but today is the actual day I turn the ripe ol' age of 34. As a birthday gift to myself, like last year, I took the day off of work today! I think everyone should have off on their birthday, don't you? 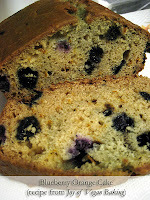 :) I'm sitting here with my morning coffee, eating a slice of Chocolate Berry Loaf for breakfast (main post photo, above). Mmm.... would be a sin not to share! One of my goals for my blog this year is to adapt more recipes and share them with you... I haven't done a very good job so far, but last night I converted this recipe into an animal-free version and it came out pretty good. 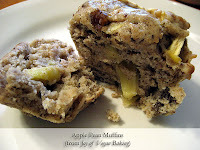 This recipe was adapted from a recent women's magazine. 1) Heat oven to 350 degrees. Coat the three mini loaf pans with cooking spray or oil. 2) In a small bowl, mix together cocoa powder, 1/3 cup sugar and 1/3 cup water until it's a smooth consistency. Set aside. 3) In a larger bowl, mix together flour, bakig powder, baking soda and salt. 4) In a medium-sized bowl, mix together remaining 3/4 cup sugar, your chosen eggs substitute, oil and almond extract. Whisk in sour cream. 5) Stir sour cream mixture into the flour mixture until well-blended. Mix 1 1/2 cups of the batter in with the cocoa mixture, along with the chopped berries, until no white streaks remain. 6) Drop alternating spoonfuls of batter into the mini loaf pans, then swirl a knife through the batter for a marble effect. 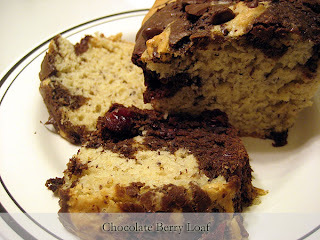 Top each loaf with one tablespoon chocolate chips. 7) Bake at 350 degrees for 35-50, until a toothpick inserted in the center of each loaf comes out clean. Cool loaves on a wire rack for 10 minutes, then remove from pans to cool completely. 1) Recipe originally called for dried cherries... I found a dried berry mix at my store and used that... couldn't resist a package of dried cranberries, blueberries, cherries and raspberries all mixed into one! 2) For the eggs, I used flax meal and water... two tablespoons flax meal mixed with 6 tablespoons water, whisked together and heated in the microwave until gooey. 3) Recipe originally called for one full cup of sour cream... I initially wanted to try this recipe with a full cup of soy yogurt in place of the sour cream, but I had a half-used tub of Tofutti sour cream in my fridge and, seeing as how I rarely use sour cream, I didn't want the leftovers to go to waste so I used half Tofutti SC and half soy yogurt. If anyone tries it with only soy yogurt, let me know how it turns out! Tonight, my honey is coming over for dinner (Thai take-out... my favorite!). We'll have dessert, too, and that will be the topic of another blog post later this week. :) But first, I need to go shovel several inches of snow off my sidewalks. It always snows on/near my birthday... never fails. Wouldn't be my birthday without snow!!! All of that baking sounds so delicious...I'll have to put that cookbook on my wishlist. Berries and chocolate are such a wonderful combination. Love that you used up your Tofutti cream cheese in the recipe, I bet that adds a lot to the texture. Mmm, what a lovely flavor-combination for a loaf - yum! And.... HAPPY BELATED BIRTHDAY!!! :0D Yes, my birthday is in April, and there's always snow present, haha. Oh you should not have to shovel snow on your birthday! At least you can come back inside to tasty treats afterwards. Enjoy your day! Yum that loaf looks good... and Thai food sounds like the perfect way to celebrate a birthday :o). Happy Birthday! I too am a big supporter of the birthday ditch day tradition. Thanks for the Joy of recommendations - I haven't tried those recipes yet, and your chocolate berry loaf sounds delicious - a perfect birthday breakfast! Ooh, I'm excited to read/see about your ice cream-making adventure! Happy birthday! I am 34 too--but only for a few more months! You are definitely an accomplished-beyond-your-years baker! Happy Birthday Jenny, I am glad you are taking the day off for your birthday! Your cakes loook fab! I will remember the frozen blueberry tip! This looks and sounds terrific!